This home is in an excellent location! Completely Remodeled Modern Home! Bike to Crosby Landing or Skaket Bay Beaches, Walking distance to fresh water ponds & Nickerson State Park connecting to 22 mile Cape Cod Rail Trail for biking! Deeded access to kettle pond! Location! Location! Welcome to "Cape Dream" - A newly remodeled home inside and out! This 4 bedroom, 2 1/2 bath home has two beautiful bedrooms on the first floor, one with a king bed, the other with two twins and a pull-out twin portable bed. There is also a full bath on the first floor. Upstairs you will find a king bedroom with a half bath and a second bedroom with two double beds. There is also a full bath on the second floor. You will enjoy plush mattresses in all of the bedrooms. All bed linens are provided which is rare on the Cape! Also included are bath and beach towels. The kitchen has new appliances and is fully equipped and stocked with all the cooking and dining essentials you will need to create wonderful dinners together. The house has A/C in all bedrooms and main living space, Wi-Fi, flat screen HD 55 inch TV in the family room, a grill, beach umbrellas, chairs and beach toys all for your enjoyment. After a day at the beach, rinse the sand off your toes in the outdoor shower and enjoy barbecuing on the back deck, or relax by the outdoor fire pit! The house has deeded access to Owl Pond for swimming, kayaking, or fishing, and walking trails nearby into Nickerson State Park where you can hike, trail ride, fish, swim and enjoy one of the many ponds and beaches. The best of both worlds- you can go from the crystal clear, freshwater pond beaches at Nickerson State Park, to the refreshing saltwater at Crosby Landing or Linnell Landing on Cape Cod Bay. We are also a short 5 minute drive to nearby Orleans where you can enjoy Skaket Beach, and Eldridge Park for the famous Cape League baseball games! 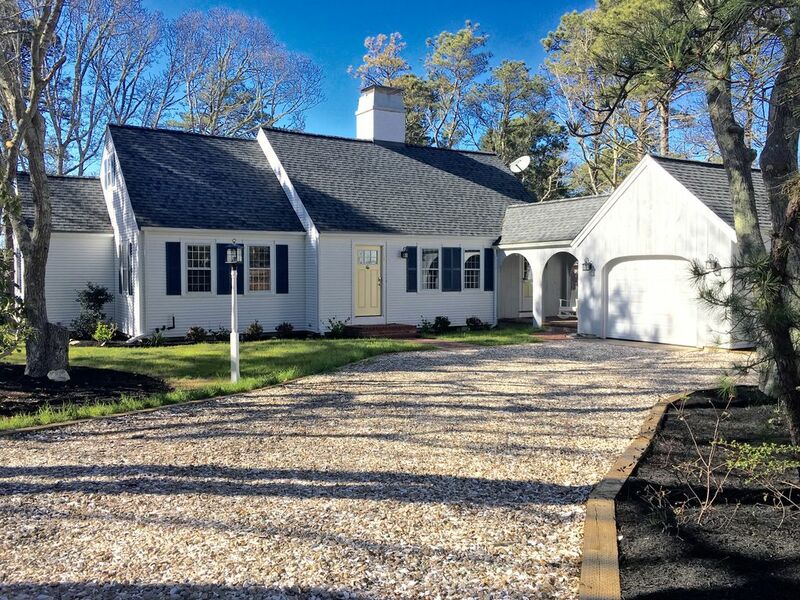 Having rented a number of homes on the Cape before purchasing this one, we are mindful of the things that make a great vacation, such as location and great amenities! We believe we have captured these in Cape Dream, ensuring you have the most enjoyable vacation on the Cape. All you need to bring is yourself! Ask us about our cancellation policy for your flexibility. Having traveled to the Cape during the summers when we were young, we returned with families of our own so our children could experience this unique area with so much to offer. After renting homes in the Cape for the past six years, and missing this special area every time we left, we decided to purchase a home to enjoy throughout the year, and also rent for others to enjoy. We looked for quite some time for the perfect place that met our criteria with location and home design being a main priority. Aptly named "Cape Dream" we believe this home captures the best of the Cape. This home is in the perfect location being on the Orleans border close to Skaket and Nauset Beach, and with the extra perk of having deeded access to Owl Pond, you can walk your kayak or SUP board to the water. The home also has trails leading into Nickerson State Park where you can enjoy freshwater ponds, beaches, fishing, boat rentals, and bike trails. shower, outdoor shower, Rinse the sand off your toes in the outdoor shower! All bathrooms are completely renovated with modern touches. Bath and hand towels provided. Home includes all linens (bed sheets) as well as pillows, comforters and blankets for all beds as well as mattress pads on all beds. New linens for 2019 season! Beach chairs, umbrellas and beach toys can be found within the garage for Guest use. The living room with beautiful wide-plank hard wood floors includes a new 55 inch HD tv, DVD's, Blue-Ray, games, and books. Completely remodeled with granite counters and tile floors you will find all brand new appliances. It is fully equipped and stocked with all the cooking and dining utensils you need. Dining table seats 8 plus there is an adjustable height table with leather top stools in the family room with seating for two. Books and magazines ranging from children to adult are available. Enjoy Cape Cod magazine, browse through Lighthouses of Cape Cod and other books regarding the highlights of the Cape. Adult and children board games can be found in living room. A foosball table that converts to a small pool table along with other games can be found in the lower level of the home. PS3 games can be found in bedroom with two full-size beds. Walk from the home into Nickerson State Park where kayak and canoe rentals are available on Flax Pond. Cape Dream was the perfect vacation home. Great location, quiet neighborhood yet close to Nickerson Park, great restaurants and beautiful beaches. Enjoyed cooking meals in the updated kitchen and using the grill on the deck. Thank you so much for the review. We are so glad you enjoyed your stay on the Cape and in our home. We hope that you will return in the future. We had an amazing summer vacation staying in this house. It has a great layout, well- equipped, very clean and is located in the quiet area. The moment you walked in you immediately feel very welcoming and cozy. The owner did an amazing job in decorating and paid attention to details. Prior to our arrival, the owner would share many tips and suggestions of restaurants, area attractions etc. It was very organized and made you feel very welcomed. We are a family of four with two young children (2 yrs and 4yrs) sharing the house with a family friends who also is a family of four with two kids(5yrs and 10yrs). The layout of the house is PERFECT: one family took 1st floor while the other stayed on 2nd fl. There’re 1.5 bathroom upstairs and one full bathroom downstairs. Both families have their own privacy at night while we can be closed together during the day. I was most impressed by the thoughtfulness of the owner: they had the bedroom set up with toys and supplies based on our headcounts and ages of the children! One room has books for 2-4yrs while the other room has video game and TV for older kids. There’s also children Tylenol available in the bathroom cabinet. In addition, the kitchen is fully equipped with all supplies and tools- everything is clean and is in perfect condition. You can tell the love and care the owner invested in this property! My four years old says, ‘ Mommy, I don’t want to leave. I want to stay in this house!’ I couldn’t agree with him more!! Thank you Kelley for sharing this amazing property. Thank you so much for the kind review. We are so glad you had a wonderful time at the home and that the layout worked perfectly for your two families. Glad to hear your little one enjoyed it as well! We hope you will return to stay with us in the future. We are two families who travel together each summer (four adults and three elementary school-aged children), and we stayed in this charming home for five nights in June. It was simply perfect for our needs. One of the other adults in our group even commented, "This is my favorite house we've ever stayed in together" (and there have been quite a few!). The layout of the home is ideal for two families with two bedrooms downstairs (one with a king and one with two beds) and two bedrooms upstairs (one of these also a king and the other with two beds). Each floor has a bathroom. The home is in an idyllic setting amid towering trees, steps from a state park (with hiking trails), and a short drive from restaurants and grocery shopping. The neighbors we met were kind and welcoming, and Kelley was incredibly responsive to questions and any needs that arose during our stay. We were all over the Cape during our visit, and with the home situated in picturesque Brewster, we were mid-Cape, making everything we wanted to see within a 30 or 45 minute drive. We took the ferry to Nantucket for a day trip, we visited Chatham for shopping, we hit the beaches in Dennis, we rented bikes in Falmouth and biked the Shining Sea Bikeway, we went saltwater fishing near Truro, we sampled oysters in Wellfleet, we toured lighthouses in the Cape Cod National Seashore, and we took in the sights in Provincetown. Our comfy home-away-from-home was always a short drive away. In the immediate Brewster area, there's the museum of natural history, Nickerson State Park, and the Brewster General Store, plus the homeowners have provided a notebook with their favorite sights and restaurants around town. The restaurants were incredible, but we also cooked several meals in the kitchen, which was well stocked with everything we needed. We gathered around the firepit one clear evening and gazed at the stars, which were very bright on this part of the Cape. In the summer, the sun rises early here, and we were so grateful for the blackout shades and curtains in the bedrooms (not all rentals think of this amenity). The kids loved the basement with games and the spacious backyard area. The home has flatscreen TVs with cable in the living room and three of the bedrooms (if you care about having that sort of thing on vacation). We adore this part of the Cape, and this home made our stay even more special. We plan to return! Excellent stay at Cape Dream for Memorial Day weekend 2018! This house is updated, clean, bright and has all the amenities you could want. Easy access to 6A and beaches while located in a quiet neighborhood that is great for running and walking. We stayed with 6 adults and 1 baby and there was more than enough room for all of us, it was great to have a full dining table for us all to sit around! We enjoyed having an updated kitchen and bathrooms, definitely a plus as compared to many other rentals available! Kelley was extremely responsive, helpful and pleasant to work with leading up to our stay. We look forward to planning another stay soon! Thank you so much for your kind review. We appreciate it. We are so glad you enjoyed the home and the surrounding area, and hope that you return to stay with us in the future. More comfortable and restful than my own home. Fall hiking and biking in wonderful weather after the crowds and traffic have departed. Incredible value, especially because of the reduced off season rental rates. Lovely home in a quiet neighborhood with easy access to a local fresh water pond and area beaches. Home is nicely decorated, bedrooms are generous in size. Kitchen is well stocked with pots/pans/storage containers/ glasses, more than would be expected for a rental property. Back yard is small but private with a fire pit area. Deck off the kitchen in the back for out door dining. We enjoyed our stay. The owner is very prompt with any emails requests or questions. Thank you for the review. We are so glad you enjoyed your stay in our home and on the Cape. We hope to have you stay with us again in the future. The property is located in an ideal location, on the Brewster and Orleans border close to both Crosby Landing Beach and Skaket Beach on the bay side, yet only 5 miles to the big surf of Nauset Beach on the National Seashore. Enjoy deeded access to Owl Pond, located behind the house where you can kayak, SUP board or swim. The house is 5 minutes to Shaw's Grocery Store, and located within walking distance to Nickerson State Park where you can enjoy fishing stocked ponds, swimming, beaches, bike trails, hiking and picnics. House contract including cancellation terms to be sent for review and signature. A local area information sheet regarding restaurants and nearby attractions will be sent to assist you in planning your vacation getaway.